The completely redesigned, refined, and re-engineered Cadet XL is an all-around upgrade from the previous Cadet 6000. It has the same lifting capacity, higher-grade materials, a lot more steel, and just about every tweak was made for better functionality. The Cadet 6000XL was designed from scratch in Dannmar's Moorpark, CA facility. 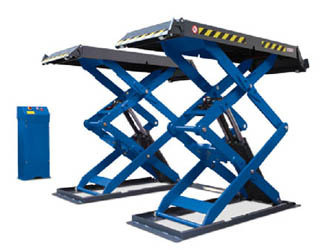 The Cadet XL mid-rise scissor lift is a 6000-lb capable lift, that is perfect for wheel service shops. 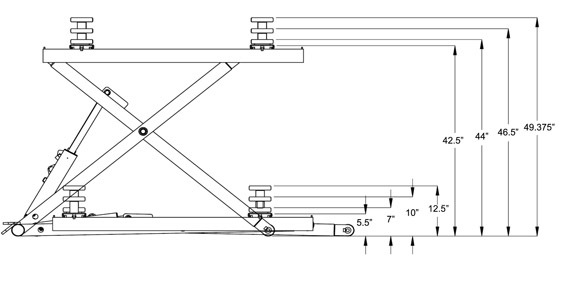 It doesn't take up an extra bay, which, as a shop owner; you will find very helpful. With it's ability to be moved out of the way when not in use, it means more efficiency for your shop. The arm assemblies have one of the widest range of movement in the industry, making it a perfect fit for even more vehicles than before. The steel wheels have increased in size since the original Cadet 6000, the gauge of steel has increased all around, the power unit is far more efficient and powerful: even the power unit cart has been completely redesigned. It raises fast, it's far sturdier than the competition. It has multiple safety lock bars, a reliable power unit, 48" max lifting height, and is all-around blowing away the competition since its inception. If you want the top of the line for mid-rise lifts, this is it: plus the price puts the value way above the rest of the market. To make the Cadet truly portable, we made it so it can fit just about anywhere. With its ability to lay flat, it can slide under for storage, and you can drive right over it. To make a truly portable lift, the Cadet rolls around on steel casters, making storage easy. The hook on the power unit fulcrums the hook point on the opposite end of the lift, allowing you to lift one side with the power unit while the other side rolls along. 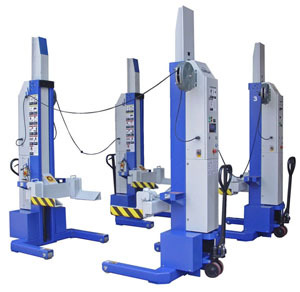 The uniqueness about this portable power unit is the hook at the bottom, allowing you to fulcrum the lift over, so that when you roll the power unit, the lift can move around on its casters as well. Despite its size, the Cadet 6000XL can lift up to 6,000-lbs. It will lift your work truck with ease. Rest easy while a vehicle is resting above you. The heavy-duty steel safety locks are robust and stronger than the original Cadet 6000. Want full access to every part of your vehicle while servicing it? The Cadet 6000XL is perfect for you. 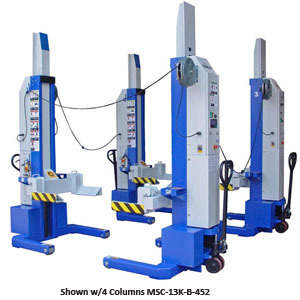 With easy access to panels, wheels, and undercar - this lift is perfect for body and restoration shops. The Cadet XL comes with all the adapters shown. Now you can easily adapt to more vehicles than ever before.